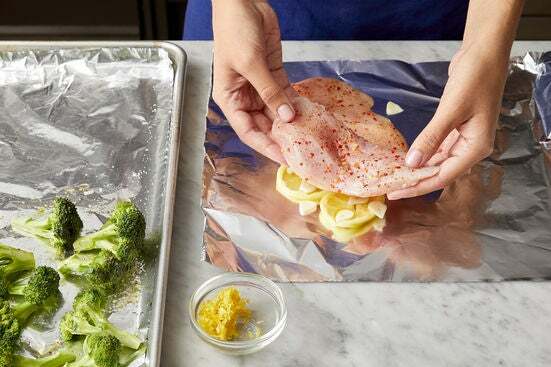 In this recipe, you’ll learn how to oven-steam chicken—layered over aromatic lemon and garlic, then sealed inside foil for juicy results. 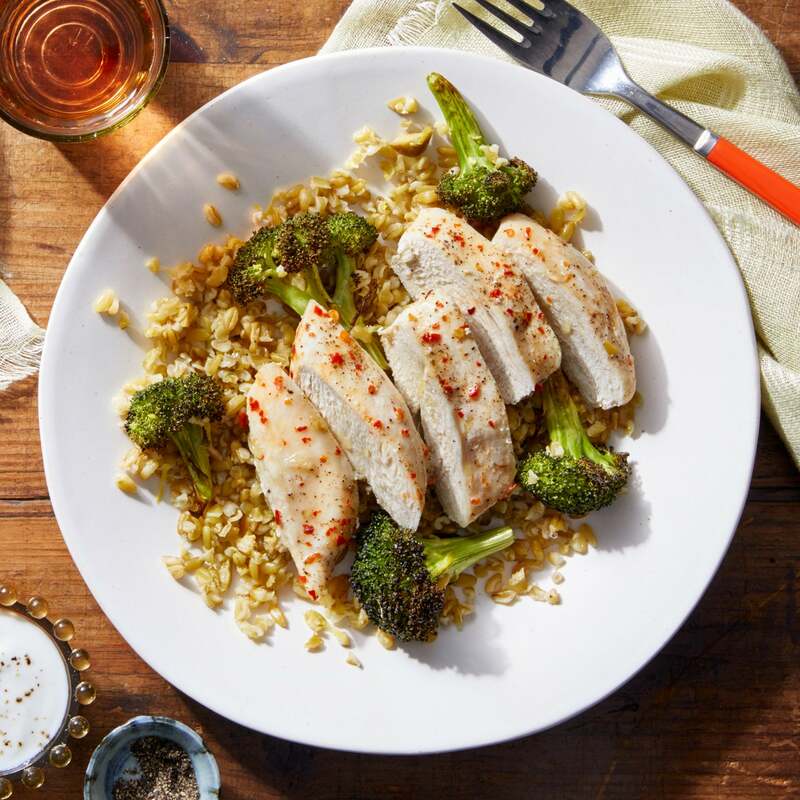 We’re serving it over a hearty bed of freekeh (a type of wheat harvested young, then toasted) tossed with roasted broccoli and briny olives. Place an oven rack in the center of the oven, then preheat to 450°F. Heat a medium pot of salted water to boiling on high. 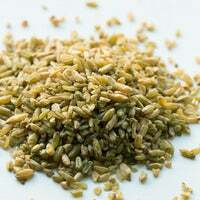 Once boiling, add the freekeh and cook, uncovered, 24 to 26 minutes, or until tender. Turn off the heat. Drain thoroughly and return to the pot. Cover to keep warm. While the freekeh cooks, wash and dry the fresh produce. 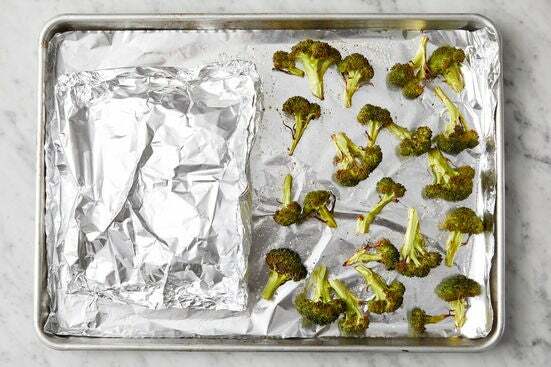 Line a sheet pan with aluminum foil. 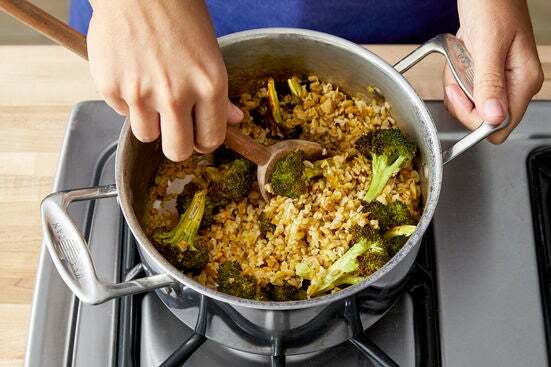 Cut off and discard the bottom 1/2 inch of the broccoli stem; cut the broccoli into large florets. Place on the foil. 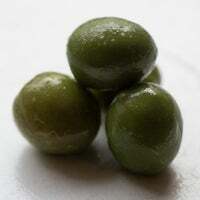 Drizzle with olive oil and season with salt and pepper; toss to coat. 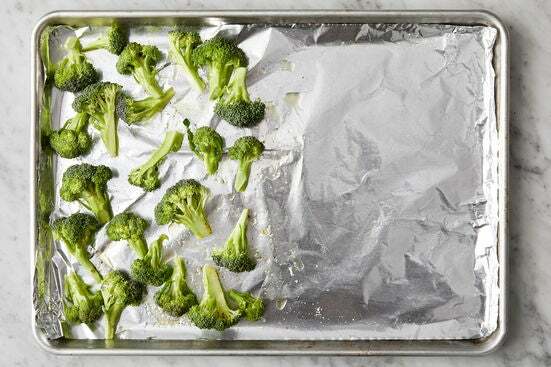 Arrange in an even layer on one side of the sheet pan. 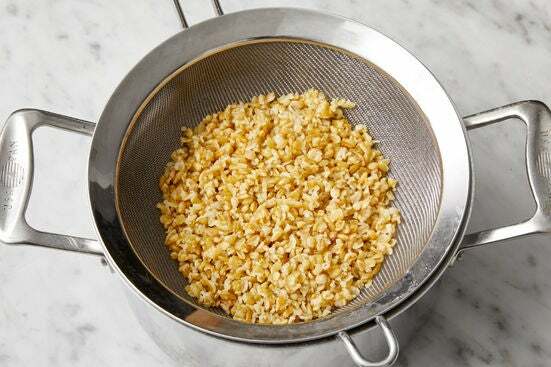 While the freekeh continues to cook, peel and thinly slice the garlic. 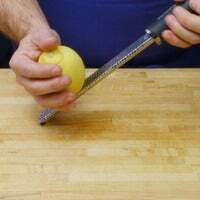 Zest the lemon to get two teaspoons (if you don’t have a zester, use a peeler to remove the yellow rind, avoiding the white pith; mince the rind). Halve the lemon crosswise. 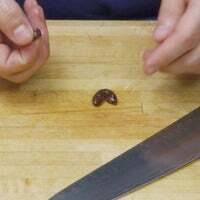 Thinly slice and deseed one half, keeping the other half intact. Pat the chicken dry with paper towels; season on both sides with salt, pepper, and as much of the red pepper flakes as you’d like, depending on how spicy you’d like the dish to be. Place a large, rectangular piece of aluminum foil on a work surface. Place the sliced lemon and garlic in an even layer on one side of the foil. Top with the seasoned chicken, 1 tablespoon of olive oil, and half the verjus. Fold the foil in half over the seasoned chicken. Roll and crimp the three open edges inwards to completely seal the packet. Carefully transfer to the other side of the sheet pan of seasoned broccoli. 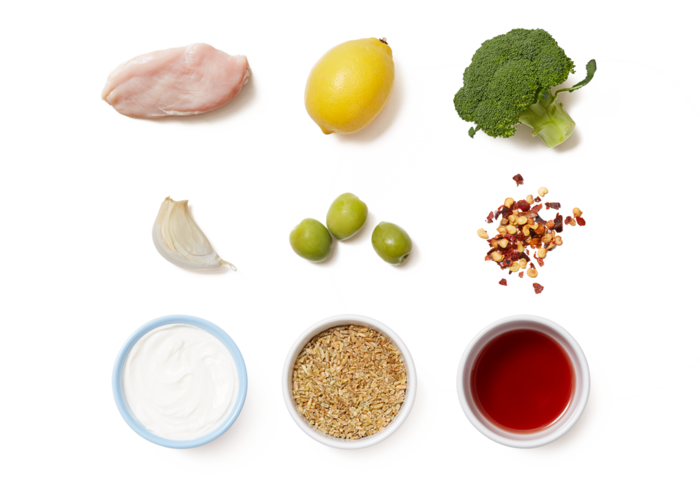 Bake the chicken and broccoli 20 to 22 minutes, or until the broccoli is tender when pierced with a fork and the chicken is cooked through. Remove from the oven. Carefully transfer the foil packet of baked chicken to a work surface. While the chicken and broccoli bake, using the flat side of your knife, smash the olives; remove and discard the pits, then roughly chop. 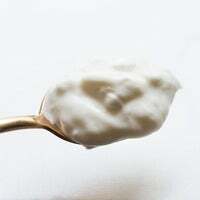 In a bowl, combine the yogurt and the juice of the lemon half (discarding any seeds). Season with salt and pepper to taste. To the pot of cooked freekeh, add the roasted broccoli, chopped olives, lemon zest, 1 tablespoon of olive oil, and the remaining verjus. 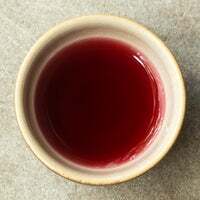 Stir to combine; season with salt and pepper to taste. Carefully open the foil packet of baked chicken; let rest at least 2 minutes. Reserving any liquid in the packet, transfer the chicken to a cutting board. 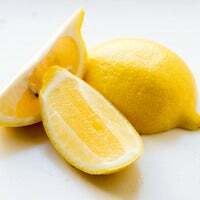 Carefully remove and discard the garlic and lemon slices. Slice the rested chicken crosswise. 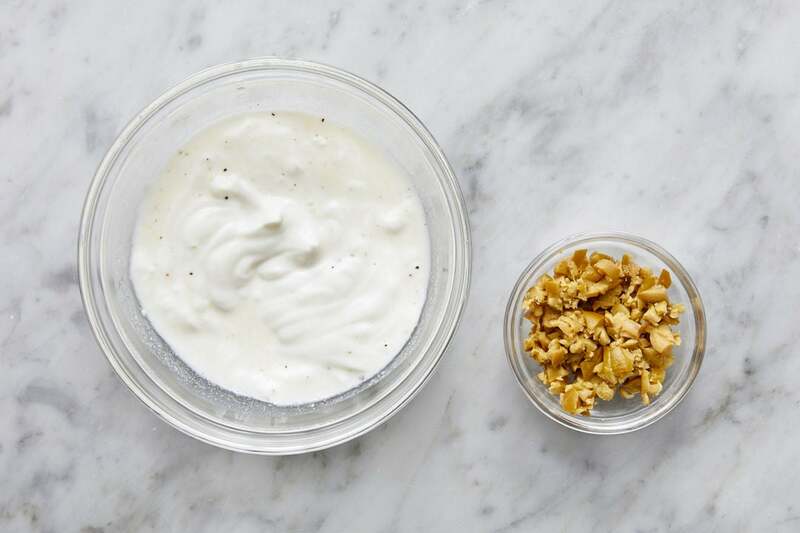 Serve the sliced chicken with the finished freekeh and seasoned yogurt on the side. Top the chicken with any reserved liquid from the packet. Enjoy!